Week 4, day 2 was HARD! It was hard but you pulled through and that is a success story for the day. I hope you will be able to rest well before your next run. Well done. 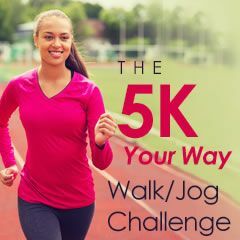 I worked through the walking 5K program. Piece of cake. Immediately started the walk/jog 5K program. So far, I've had to push myself a little, especially at the end of the workout. Today however, was a different story. My body was still a little sore and stiff from Monday's workout. I did 40 minutes of gentle yoga stretches yesterday and took it easy most of the day. When I started the workout today, I began thinking about how long and how far I had to go immediately. It was physically hard. Maybe I should have rested another day. BUT I MADE IT THROUGH THE WHOLE WORKOUT!